The Adlington Folk Dance Club was founded in 1955. Dancers dance a mix of Playford dances, ceilidh dances, American style contras (or square dances) and anything else the callers fancy. 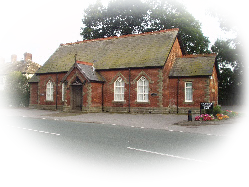 The Club meets every Wednesday throughout the year between 8pm and 10pm in Adlington Village Hall, Mill Lane, Adlington, SK10 4LF. Visitors are very welcome to come along. You don't need a partner and no experience is necessary as all dances are walked through and explained. What is English Country Dancing? English Country Dancing is not hard to learn. If you can walk and know the difference between left and right, you already have much of the basic knowledge that you need. Most of the movements are based on a walking step. A caller prompts the dancers to move in a number of specific ‘figures’ or movements. The instruction for each figure is given in time with the music and there is no need to rely on memory alone. English country dancing is social and friendly. The atmosphere is informal and no special clothing is needed. There is a different caller each week and each week is independent of the last, so you are not tied to every Wednesday. Interested? Would you like to give it a go or watch for a while before taking the plunge? Turn up at the Village Hall in Adlington on a Wednesday at 8:00pm.